Microsoft Word is one of the most widely used programs for creating document files. It was released in the 1980s and has undergone a great number of subsequent upgrades. The native file formats for Word are DOC and DOCX — the former was part of the Word editions released until 2007, while the latter was included in those released afterwards. Microsoft Word’s formats are compatible with both Windows and Mac platforms, and are also supported by some non-Microsoft applications, such as the popular open source processing program Open Office Writer. Apart from DOC and DOCX, reaConverter also supports RTF (Rich Text Format) – a Microsoft Word format whose aim is to retain the format features and content of the original document, irrespective of the application with which the document is opened or edited later on. This helps avoid the slight changes that might appear when using Word 2013 for Windows to open a DOC file created with Word 95, for example. 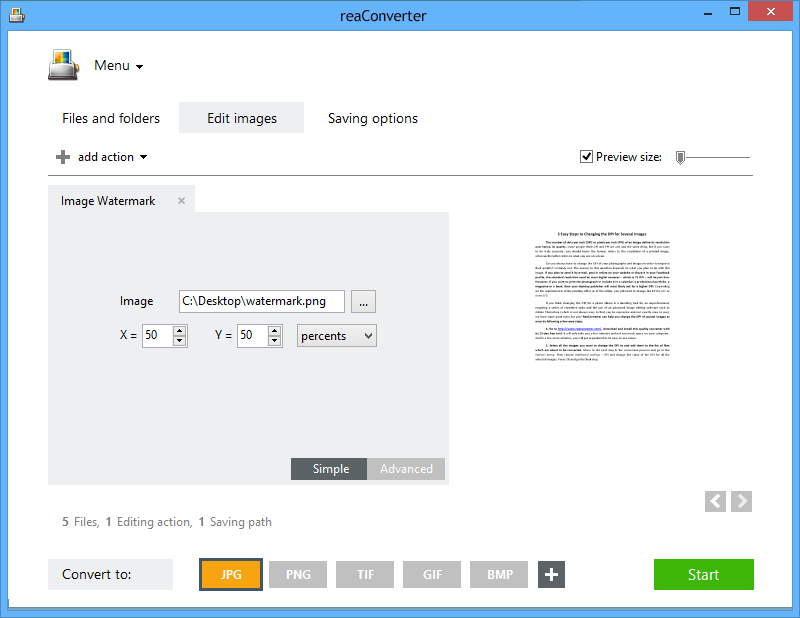 reaConverter supports conversion from DOC, DOCX and RTF to over 50 formats, including PDF and several popular image formats such as JPG, PNG, BMP, or TIF — as well as other less known or rarely used extensions. 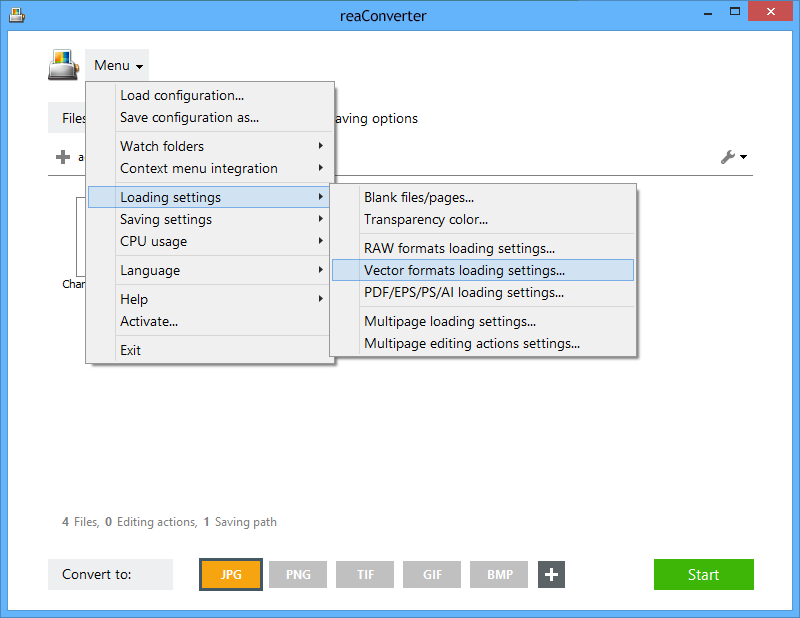 Download and install reaConverter. 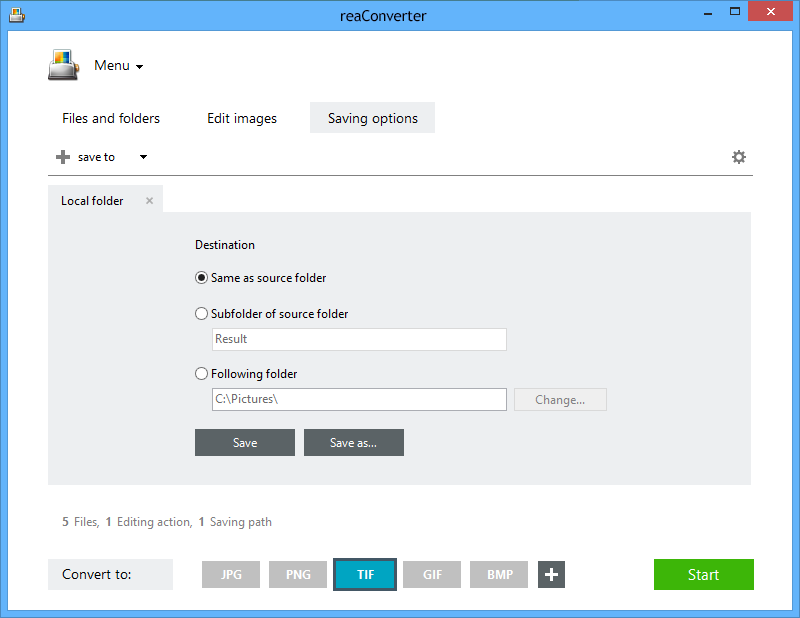 Load one or more document files into reaConverter, by using the handy drag-and-drop tool or by selecting them manually from your hard drive. reaConverter allows you to customize the loading quality by accessing the Menu button, and then Loading settings → Vector formats loading settings. Here you can enter a particular figure to define how the vector image should be resized. In the Edit images section you can pick one or more editing features that will be included in the conversion process. 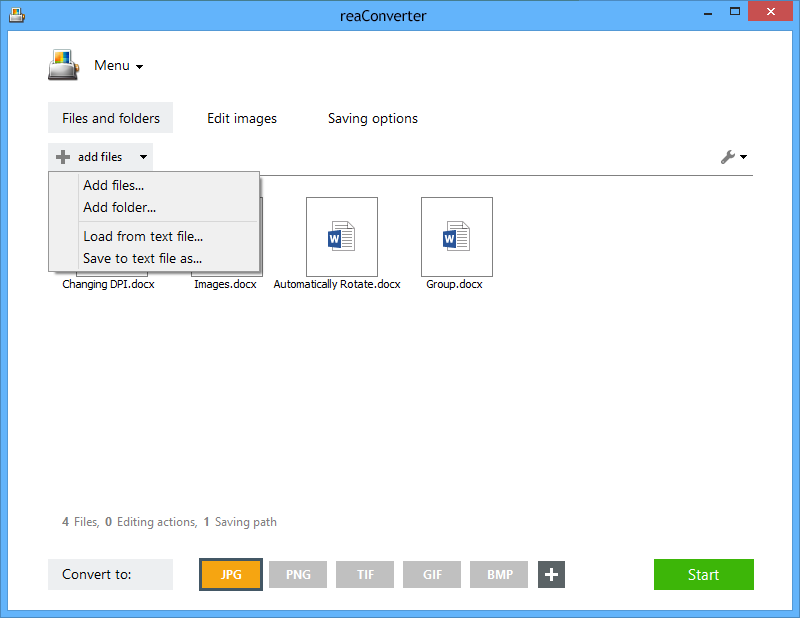 You can select to rotate, resize, crop or watermark your files, among others. Finally, go to Saving options and pick the location for your output files. They can be saved online of offline, in a storage cloud or in a local folder of your choice. Last but not least, choose the format of the output files by simply pressing one of the buttons placed in the lower part of the window. 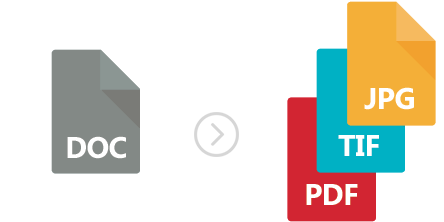 PDF is among the options, as well as JPG, PNG, TIF, BMP and lots of others. Next, press the Start button and your newly converted files will soon be ready! Advanced users can convert MS Word DOC and DOCX files into images via command line interface in manual, automated or scheduled mode. You are welcome to contact our technical support when you have any questions about reaConverter.